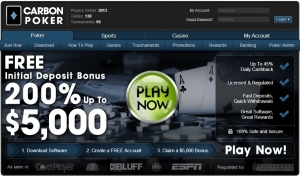 Carbon Poker is the new leader of US online poker after the 2011 crackdown of the majors. It is perfectly legal to play at Carbon Poker as they comply to all US & international online poker laws. Don't let the name fool you: Carbon Poker isn't your run-of-the-mill, carbon-copy online poker room. In fact, Carbon Poker, named after the strong stuff diamonds are made from, is much like any natural diamond, quite unique. From the site's pleasing aesthetics to its exclusive promotions and well-thought out VIP club, Carbon Poker is a unique online poker offering that discerning poker aficionados will appreciate. And it is the best choice in 2014 if you live in the United States. Offering players a plethora of promotional offerings, Carbon Poker clearly weighs in heavily in the area of promo's and perks. This is one reason why their traffic is rising rapidly. Just some of the goodies on their play list include a $50,000 Grand Prix promotion where the top 500 players on the GP leader board split a prize pool of $50,000 smackeroos. As well, Carbon Poker features a monthly Tourney King promotion, worth over $20,000. Here, the top dog on their TK tournament's leader board wins the whole pot. Other promotions include the ever popular Super Money Tree where players can win cash for up to 10 days worth of VIP points along with an unusual NFL promotion (unusual at least for a poker room) where players can make their Straight Up winner selections from Carbon Poker's weekly NFL matchup. Winners that get it right subsequently receive a coupon to play in an NFL freeroll. Carbon Poker gives first time players a chance to make some pretty big money right out of the gate. New players can receive a 200% match bonus up to a very nice $5000 in free poker cash. This deal is only available at our site, use carbon poker bonus code CARBONPK when you make your first deposit. Sweetening this particular poker pot, Carbon Poker also gives new depositors a two-week free entry pass into their $500 freerolls. Imagine that in terms of ROI, not bad eh? Shaking up the bonus money pot even further, Carbon Poker doles out a Royal Flush Bonus to particularly skillful and/or lucky players. Players who score a RF on any real-money Texas Hold 'em game receive a 100 x the big blind bonus with a $500 ceiling. A real-world example: a royal flush on a table with $3/$6 stakes will net players a $400 cash bonus. Last but not least, Carbon Poker offers a bad beat jackpot that is often over $100,000. Simply get very unlucky with a monster hand and lose to an even bigger hand, and your bad luck with turn into great luck when you win a small fortune. Carbon Poker's VIP club consists of 5 different environmentally-friendly tiers, starting at the Earth tier, then moving through the benefits-enriched, ever-escalating levels of Wind, Fire, Water and Ether. All levels give players access to freerolls and other benefits. At the Wind level, players gain access to larger freeroll tournaments, heftier cash rebates, and larger cash exchanges, along with some other added benefits. Carbon Poker offers hard-core poker fans many different games to choose from, including Texas Hold 'Em, 7 Card Stud, Omaha, 5 Card Stud, Razz, Deuce to 7, Ace to 5, H.O.R.S.E, and other variants. As well, players can expand their reach by playing non poker-specific games on offer, which include roulette, backgammon and blackjack. It's always nice to find a poker room that doesn't shrink away from guaranteed poker tournaments. At Carbon Poker, weekly GTDs are a focal point, and players will find a huge range of guaranteed tournaments options around the clock, including buy-ins, rebuys, add-ons and deep stack events. One of Carbon Poker's guaranteed tournament worth highlighting is the Sunday GTD with its whopping $50,000 prize pool. One nice touch is that players can turn most GTDs into a freeroll, simply by redeeming accumulated VIP points to buy in (think frequent flyer miles). Carbon Poker gives players a nice range of deposit options, including Credit Card, NETELLER, Click2Pay, Moneybookers, eWalletXpress, Eco Card, Fonelinx and Pin debit. At Carbon Poker, support is just short of excellent with 24/7 live chat and email with a guaranteed response within 48 hours. True, Carbon Poker's support doesn't include telephone, fax or mail options, but what they do have is always professionally managed. All in all, Carbon Poker is a great place for serious online poker players to go and try to flush out their competition.